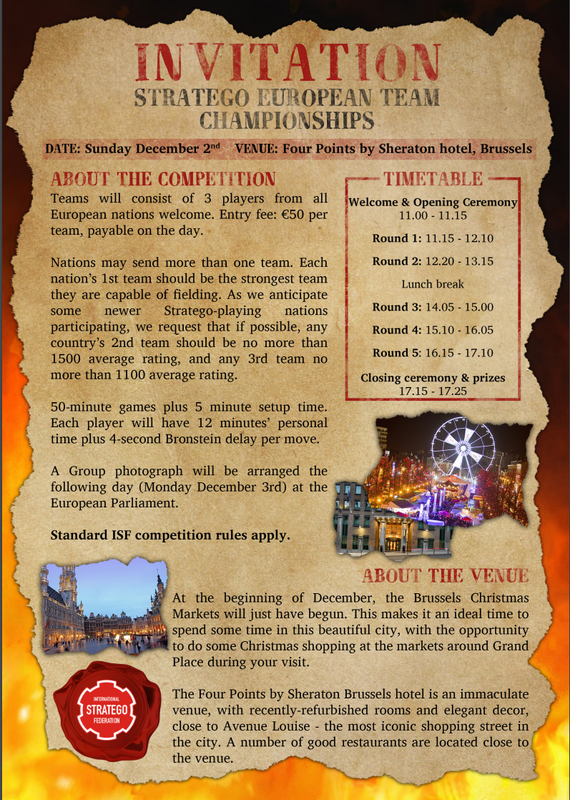 The City of Brussels is hosting the European Team Championships on December 2nd 2018. There are a limited number of subsidised places to cover hotel and travel costs for participants travelling in excess of 200km. Teams can also be registered at the same email address. Finally found the correct password to get on here. I think we might have got our wires crossed with regards to this post. The subsidy is open to everyone residing in Europe and not just the British players. I am particularly keen to invite the teams from non NSO countries who play on Stratego.com. Could you please move or copy this post to somewhere it might be seen by everyone. Can USA compete in this? I gatherered 3 Belgium teams (9 players) but there are some questions about the entrance fee (50€). Is this fee for every team (17€ each player), or only the 200k teams. Is there something included (meal, participating price,...)?